For millions of people across Southeast Asia, water resources are inextricably linked to local livelihoods and wellbeing, agricultural production and food security, and local economies. Water resources are also linked to large-scale development plans, including for irrigation and hydropower development. The “Capacity Building and Professional Development of Water Governance and Regional Development Practitioners in the Mekong, Salween and Red river basins (MK31, 32 and 33)” project will strengthen the capacity for undertaking research and policy engagement of scholars and practitioners of water, land and energy use, management and governance in the Red, Mekong and Salween river basins. A particular cross-cutting focus of the project is research on gender and other forms of social marginalization. It also intends to build a learning community amongst these scholars and practitioners. 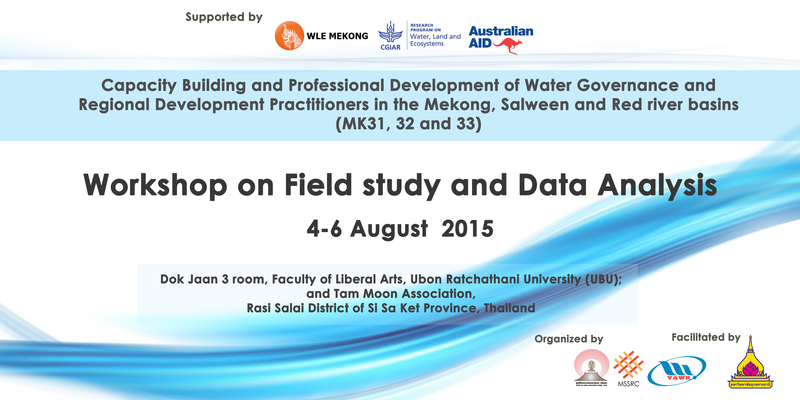 Our first workshop was held in Hanoi on 20 – 22 June 2015, hosted by the Vietnam Academy of Water Resources. The focus of that workshop was on preparing a detailed research design. In this second workshop, we now focus on the principles and best practices of undertaking fieldwork, and how to document and analyze the findings. This workshop, hosted by the MSSRC, Faculty of Liberal Arts, Ubon Ratchathani University, will entail workshop based discussion and practical experience in the field.